→How To Rewire A Fluorescent Fixture For LED? This age is an age of technology and advancement. People always go for such products which can not only be long-lasting but also provide them with adequate facilitation. In your daily lives, nothing can be more significant and important than the electronic devices that you use. Nonetheless, if you update these devices, it always acts as a cherry on the cake. Now, how about updating the fluorescent fixture that you use. Firstly, since you are planning to adopt something that costs less and provides a generous amount of light, what purpose would they be left off with if the output is less? Fluorescent tube lights hold importance that no one can ever deny. From houses to commercial usage, they have been of great usage. The method to rewire the fluorescent fixture to accommodate the LED could not be an easy one. The reason is that the physiology of all the fluorescent fixtures is not the same. In this article, I would be giving a detailed account of the steps which would be of significant help in the conversion process. Note that, there could be different conversion processes depending upon the type of fixtures. 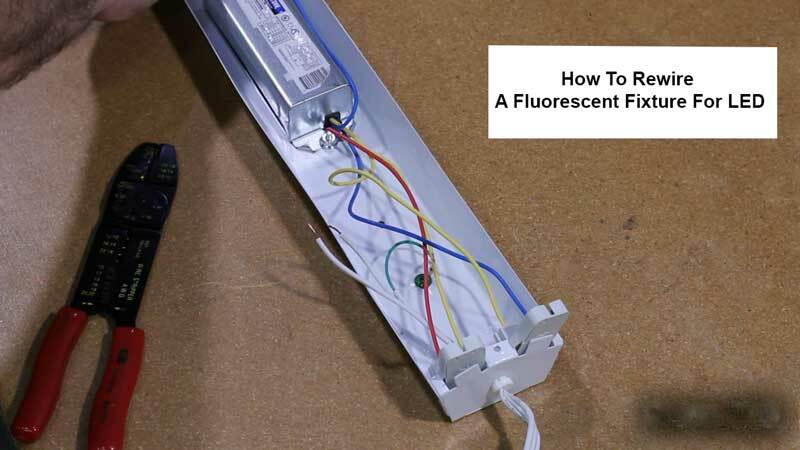 This is one of the easiest methods to convert the fluorescent fixture into LED lights. First of all, remove the cover of the fluorescent tube that has to be converted. There will be three sorts of wires. Black, Green, and White. White is for neutral and black is for hot. The Green wire is the ground wire which is an important one. Remove the wire nuts. You will have to make the three wires loosen from each other. Also, pull away from the wires from the ballast, and thus you disconnected power from the weight. In the third step, you will now bypass the ballast. You can also remove the ballast in whichever way it may suit you. Since the wires have been cut and to make them stay in order, take quick connects for the wires. As discussed above, there are three types of wires. With the help of quick connect, the cables are assembled. The light fixture is thus divided into two ends; a neutral side, and a hot side. Cut off all the extra wiring from the hot side. The wires of the hot side are now taken and tugged into the connector. All the cables on the hot side are assembled into the connector. Now at the neutral side, with the help of a wire cutter, the extra ends are stripped off. All the wires are now assembled into the connector on the neutral side. The fluorescent fixture has now been converted to LED light. Insert the LED bulb, and you got your economical LED bulbs. Besides rewiring of fluorescent fixtures, this is another method as for how to convert fluorescent fixture into the LED. In this method, the users can pass a direct wire or do a bypass of a ballast. The function of ballast is to regulate the flowing current to lamps and other electric appliances. The fluorescent fixture is thus replaced with the LED when it is rewired to bypass the ballast. This method can be considered economical as compared to the replacement of fluorescent fixtures since the older ballasts need not to be replaced. While inserting direct wire or ballast, safety measures have to be followed since it can get hazardous at times. While converting the fluorescent fixtures, there are some points that you have to keep in mind. Whenever you replace the existing fluorescent fixture with LED tubes, make sure you use single-handed LED tubes preferred over the double-handed ones. The reason for preferring the single-ended tubes is that there you will need wiring at just one end instead of wiring at both ends as in double ended tubes. There is a slight reservation regarding the one-ended tubes that you can't use the old existing lamp fixtures and have to install new fixtures, unlike in the case of two-ended tubes where you can work with the already existing lamp fixtures. While you convert a fluorescent fixture into LED light, most often the type of socket also causes complications. The LED lights require non-shunted sockets. Whereas, for fluorescent fixtures, it could be either way. They can use both shunted and non-shunted sockets or tombstones. LED lights prefer non-shunted sockets since inside this type of outlets, the contacts are separated from each other. And so the voltage from one contact point doesn't transfer to the other, unlike the shunted sockets. It can be thus stated that the conversion process of the fluorescent fixture into LED lights is a need of the present age. There are many reasons for this. First and foremost, LED lights are economical and environmentally friendly. Secondly, now there are no more fluorescent bulb or their appliances available in the market. To avoid any hassle, you must update your fluorescent fixture into LED lights. The process is a simple one but you have to be careful enough while working with the instrument. Any careless attitude towards the cutting of wires, so to say, can ruin the whole wiring system and hence messing up everything.